Art is three letters encompassing a world of imagination and creativity. Painters, designers, graphic artists, photographers, film makers, and hundreds more, fill our lives in ways we are often not even aware of, from the clothes we wear to the movies we watch. Art is a response to life and those things which inspire us, frighten us, and hold us in awe. Art challenges our thinking and opens up endless possibilities. Art is a language beyond words. Gwynneth Wallace was a lover of art who wanted to provide children with the opportunity to explore their own imagination and creativity. In 2002 she founded an art education and art appreciation program for children called Grow With Art. Her care and dedication continued until her death in 2013. Today, Grow With Art is a non-profit society run entirely by volunteers who, like Wallace, believe in the importance of art. Initially hosted by Acadia University, the program has been generously housed at the Kingstec Campus of the Nova Scotia Community College in Kentville since 2008. The program is supported by nominal fees and private and community donations. Kingstec not only provides dedicated classroom and storage space, but also hangs the large collection of framed reproductions which Grow With Art offers through their rental program. This artwork includes many prints by famous artists from Vincent Van Gogh to Emily Carr, in addition to well-known local artists. Many of the prints come with a biography of the artist attached to the back, allowing the children to learn about the artist as well as their artwork. Children are encouraged to browse the artwork and choose one to take home for a one month period for only two dollars. What began as strictly an art rental program for children has now grown to also include art workshops from 1:00pm to 3:00pm on the first Saturday of each month from September to June. For the very reasonable fee of three dollars, children take part in a hands-on workshop led by a professional artist from the area. The children are introduced to a wide variety of mediums from paint to clay. The workshops are open to youth from six to fourteen years of age and the average group size ranges from 25 to 35 participants. The program also offers great flexibility as there is no required commitment to attend a set number of workshops. Feedback from parents and children is very positive. 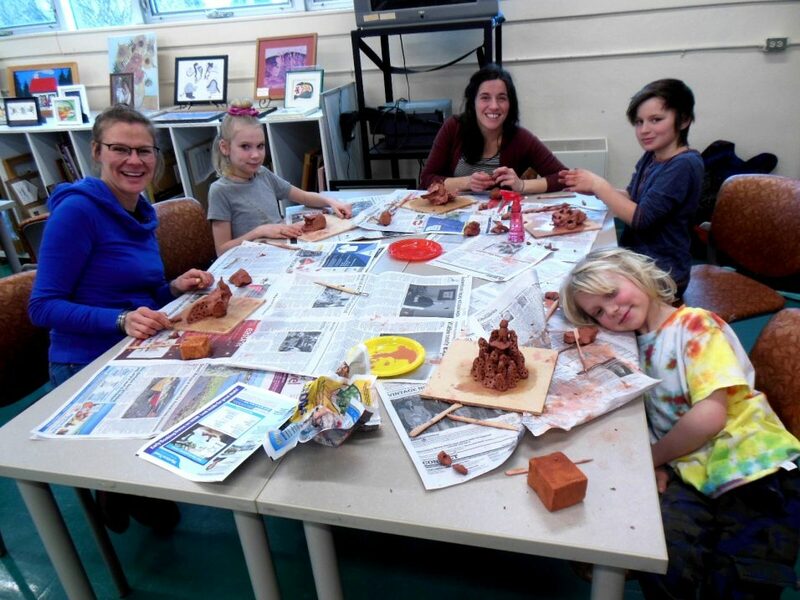 Upcoming workshops include Struan Robertson from Mermaid Theatre on April 6, calligraphy with Dr. Vincent Leung on May 4, and artist/educator Colleen Gerrits on June 1. Irene Hazel plays a key role as one of the volunteers and is proud of what Grow With Art offers the community: “it’s really important that children are exposed to art,” she explains. “Art is part of a broader education.” Just watching the children learn and become engaged in the creative process is its own reward. Grow With Art is always interested in speaking to new artists who would enjoy leading a Saturday workshop. As well, community support from local organizations or service groups is greatly appreciated to help with ongoing funding of the program. All inquiries may be directed to Irene Hazel at 902-542-0234. For further information on the workshops and art rentals, please visit Grow With Art online at: growwithart.wordpress.com.